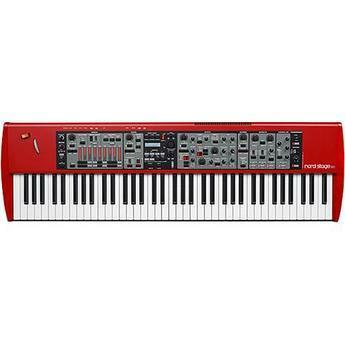 Nord Stage EX 76, Digital Synth from Clavia in the Nord Stage EX series. New OS and Sounds from Nord Keyboards have been announced. The Nord Stage EX OS is updated to v6.02. The most significant enhancement with this update is the compatibility with the v5 platform. 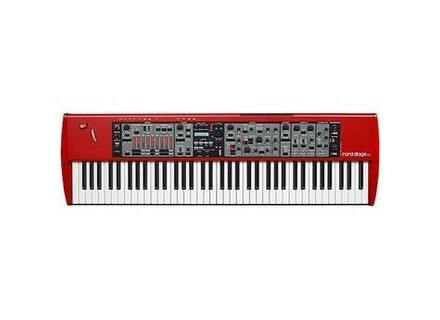 Nord have also corrected a few minor issues with the String Resonance functionality and an issue that could occur if the Swell pedal was set to ''All''. The EX OS update is accompanied by a Nord Sound Manager update. The 5.28 Sound Manager is required to be able to load the v5 Piano sounds. The Windows version of the Manager also has a self-contained installer for a new WHQL certified USB driver. The installer automatically checks your computer for installed drivers, and replaces these with new version if necessary. Note: this will not affect installed drivers for the G2 or the Electro 2 units. v5 is a new platform for the Nord Piano sounds, a platform that was developed originally for the Nord Piano. This functionality and the sounds are now available for the Stage EX series, with upcoming support for the Stage Classic and the Electro 3. The v5 platform includes both new and re-mastered sounds in the Nord Piano Library, a new version of the Sound Manager with an integrated USB driver installer (Windows versions only) and a new OS for the Stage EX series. Note: v5 compatibility is scheduled to be released in late June for the Electro 3 and the Stage Classic. The 56 different sounds that we publish today have a total size of 1.8 gigabytes. You can download the sounds for free from the Nord website, or purchase the Nord Piano Library DVD at your local Nord retailer. For more, check out www.nordkeyboards.com/main.asp for more info. Dave Smith Instruments Mopho Keyboard Dave Smith has started delivery of the new Mopho Keys, starting only within the US. Moog Music Taurus 3 Bass Pedal Moog Music says the Taurus sounds are amongst the "fattest" you've ever heard.